You are here: Home / News / NWU Crashes Ebony Power 100 Bash – Pay the Writers! On December 1, NWU crashed the Ebony Power 100 Gala at the Beverly Hilton Hotel in Los Angeles. The Gala is Ebony magazine’s annual award ceremony to honor the leading African-American figures in politics, culture and sports. NWU’s action was organized by SoCal acting chapter chair Ismael Parra and NWU VP Pamela K. Johnson. 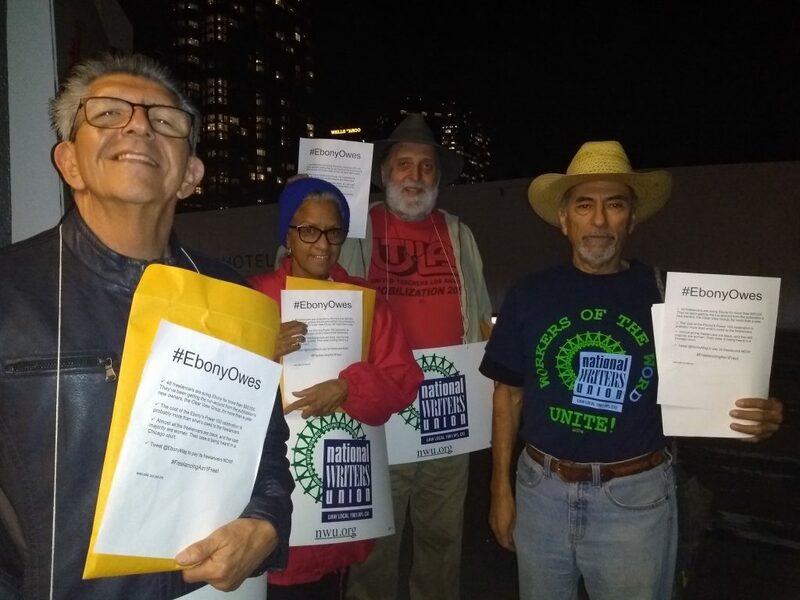 Members distributed hundreds of leaflets addressing our efforts to get 48 Ebony freelancers the $85,000 they are owed for work that was contracted, delivered and published in the magazine. In November, we had our initial status hearing in a Chicago court. Our next court date is slated for January 5. The NWU chapter worked in conjunction with UAW Region 5 CAP Director Victor Quiroz. He reached out to Congresswoman Maxine Waters (D-CA), who was receiving the Icon Award at the Gala, and briefed her on the Ebony case. She followed up with a phone call to Ebony, and her office reported that the magazine assured Waters on its intention to make good on its obligations to its freelancers. Between the court hearing and Power 100, NWU held events to support the Ebony freelancers in Chicago, Washington, DC, and NYC. These get-togethers gave our new members the opportunity to meet members of their local chapters and, in some cases, to meet other Ebony writers. Events like these build the kinds of personal ties that create a sense of community and encourage new members to stick with the union long after a particular grievance is resolved. Based on the Ebony campaign, we’ve got two more Non-Payment Grievances (NPG) in the pipeline. Both publications are based in NYC. VP Pamela K. Johnson, VP Mauricio Niebla and Head Trustee Jan Kraus were all introduced to NWU through non-payment grievances. If we can hold onto them, many of the Ebony freelancers will also make significant contributions to NWU.